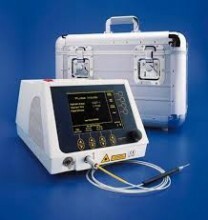 SmilePro Dental Diode Laser is an ideal package of innovative laser medicine in dentistry. The special wavelength of the SmilePro lasers is extremely suitable for oral soft tissue surgery. A high degree of absorption in water and haemoglobin combines precise cutting properties with immediate coagulation. Low thermal penetration enables safe and precise working even on critical structures. The tissues in the vicinity are spared. Click the button below to add the SmilePro 980 Dental Diode Laser to your wish list.